Thailand’s fourth largest province borders Burma to the west of Bangkok. 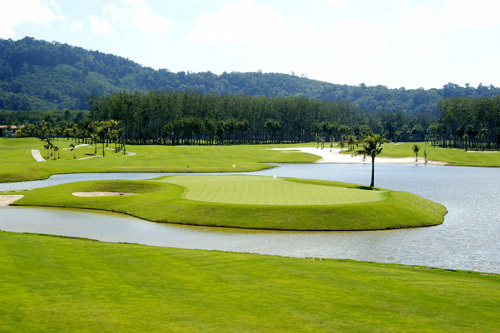 In the foot of mountainous terrain provides a wonderfully scenic setting playing golf in Thailand. Furthermore, the world-famous Bridge Over the River Kwai, immortalized in books and movies, has inspired the development of many golf courses. Finally, waterfalls, caves, local villages and historical site provide plenty of touring options during a Kanchanaburi golf holiday. A stand out feature of Blue Sapphire Golf and Resort, are the lakes, which both golf courses wind their way around. In addition to the water, the course designers have also added a number of palm trees and local fauna and flora and these frame each hole nicely. The two, 18-hole golf courses are called Canyon and Ocean. There’s a choice of five tee positions on each hole of both courses and therefore, golfers of all abilities will feel welcome. Each course is split up in to two, nine hole sections and the Canyon Course comprises the Blue Sapphire and the Yellow Sapphire. Water comes in to play on both sets of nine holes and the par-3 holes are particularly noted for water hazards, as they each play downhill and across water. Some challenging holes, especially the 17th, a par four, where water encroaches on both sides of the fairway. This standard course provides a fair test of golf. Evergreen Hills Golf Club and Resort has the unique characteristic of using different 18 kinds of tree for each 18 hole. Golfers can prove theirs body and mind competence at our 16th hole, 3rd par, among the middle of the lake and 17th hole, 4th par. The 97-room resort was neatly decorated to harmonize with nature. 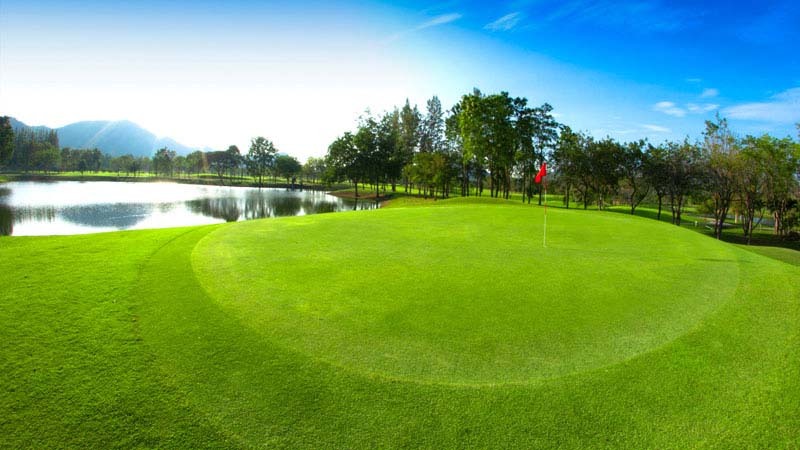 This Kanchanaburi golf course is not too long and welcomes players of mixed ability. Water comes into play on many of the holes and a long dogleg par-4 17th is a course favorite. Grand Prix Golf Club is a well-conditioned golf course in Thailand’s Kanachaburi Province that will take the breath away. The course is set in a vast open space with panoramic views of Burmese mountain ranges in the distance. The Grand Prix Golf Club signature hole is the par-5 fifth. At 557 yards, this is the longest hole on the golf course. It is designed to follow the natural landscape and plays to a large elevated green which is protected by water on three sides. Perhaps the pick of the holes at the Grand Prix Golf Club, is par-5 fifth hole, which plays to 557 yards. The green is elevated and surrounded by water, which makes it a difficult task but at the same time, the fairway follows the natural landscape, making the fifth hole a challenge and a delight in equal measure. Mida Golf Club, (formerly called The Lion Hills Golf & Country Club) is a par 72 course running at 6,844 yards. Kanchanaburi is well known for its scenic views and fabulous sunsets, and her Mida excels with heavy pine trees wooded landscapes surrounded by majestic mountains. A fairly flat layout and the greens have small undulations which make straight putting essential. The first hole, which is a par-3, is played over a natural water hazard, in the way of a river and players must cross a suspension bridge to reach the green. The river does not play a big part in the remainder of the golf course but does run alongside some of the other holes and is especially noticeable on the 13th, 14th and 15th holes. The majority of the year, playing at Mida Golf Club is a pleasure, as it’s a nice course to play but not very challenging. Mission Hills Country Club Kanchanaburi rests on gently sloping hillsides near the River Kwai where palm-lined fairways flirt with water hazards, sand bunkers, and vast waste bunkers, a Nicklaus trademark. Only accomplished players are likely to play to their handicaps on this course. Around the well-bunkered greens, thick Bermuda grass should be avoided if at all possible. Five of the holes offer dual fairway options, giving different approach options to the greens. The course has a selection of five well-spaced sets of tees for players of all abilities. The par five holes are among the best holes on the course. The 8th for example is long and very well bunkered down the left side and center of the fairway, with a beautiful stretch of water and reeds down the right side from tee to green. Hole 12 is another long one, this time with a wide creek splitting the fairway from tee to green and a double fairway that makes you choose left or right from the tee. The 17th is a par four that tests you with an approach shot to an island green. With jungle-clad hills and rural countryside all around, this is a picturesque Kanchanaburi golf course. Located 30 minutes north of Kanchanaburi town, is the Nichigo Golf Resort and Country Club. Designed by Mitsuaki Kobayashi, the course was opened to the public in 1992 and features 27 holes, split in to three sets, of nine holes. These have been named, the Lake Course, River Course and Mountain Course. The course is about 2 hours 30 minutes away from Hua Hin and is rated as, not only one of the best golf courses in the Kanchanaburi region but one of the best in the whole of Thailand. As the name suggests, the Lake Course is where the small lake comes in to play, namely on the par-4 third hole and the par-3 fourth hole. Other than that, water does not play a huge role on the Lake Course and it develops more in to a park land style course, with plenty of woodland. The Mountain Course is the most undulating of the three at Nichigo Golf Resort and Country Club. Due to the sloping terrain of the Mountain Course, this is where the best views are to be seen and the limestone hills make for a tremendous sight. All-in-all, the three courses represent their own challenge and with the well bunkered greens, many golfers will find Nichigo Golf Resort and Country Club, is a good test of ability. The off-course amenities are not great however, and many people often opt to stay somewhere near the course, which offers something a little more modern and luxurious. Opened in 1994, Royal Ratchaburi is one of the most spectacular Kanchanaburi golf courses. The hilly terrain and excellent views of Burmese mountain ranges make for aesthetically pleasing, yet challenging golf. Greens are well-kept, which is unusual for courses in such remote settings. Royal Ratchaburi fairways follow the contours of the hills and play for the most part up and down. The front nine has mostly wider fairways than the back nine, which is considered more challenging. There are some excellent, but short par-3 holes that require precise shots over deep canyons. Locals consider this a hidden gem of a course and one of the best in the River Kwai area. 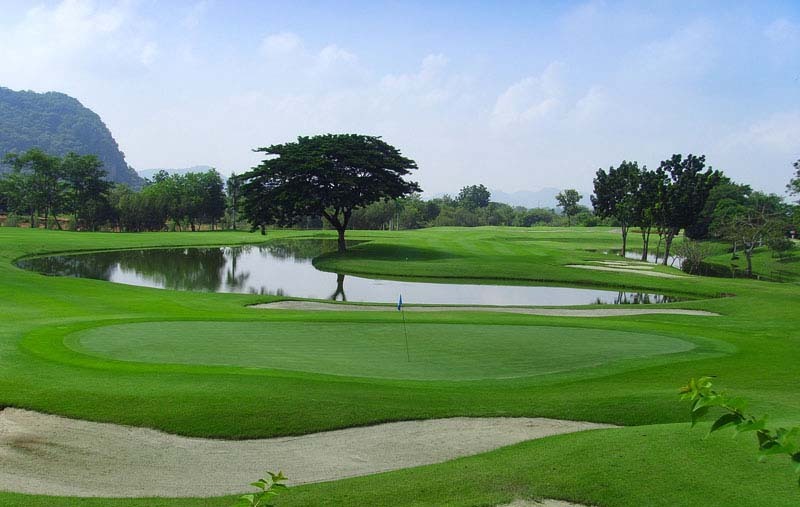 Royal Ratchaburi is an excellent course for those travelling between Kanchanaburi and Hua Hin.